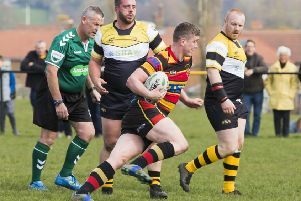 In Yorkshire One’s game of promotion monopoly, Heath used their “Get out of Jail” card to secure five points from a 26-19 home win over Wheatley Hills yesterday. An Ezra Hinchliffe penalty in the final quarter nudged them in front but they left it very late to grab a four-try bonus point, Jason Merrie ducking under the tackles to ensure a maximum haul. With runaway leaders York, Scarborough, Middlesbrough and Beverley also picking up five points in the quest for a top two finish, there was no change at the head of the table. Hills collected a losing bonus point when the referee overruled both linesmen and ruled that Hinchliffe’s final conversion attempt had gone wide. That moved them off the bottom of the table but they are still odds-on to go down with Selby notching a win. Heath were without Richard and Lee Brown and the injured Eddie Cartwright so Chris Piper and Martyn Barnes came into the pack with Sam Pollard back from injury at full back. The changes didn’t stop them surging into an 18-0 lead in 13 minutes. Hinchliffe landed a first minute penalty and Jack Crabtree and Hinchliffe then linked well to send veteran wing Si Brown over for an unconverted try in the corner. Heath were dominant and when Crabtree’s clever kick found touch 10 metres from the visitors’ try-line, Matt Beasty won the ball and Piper added another five points from the rolling maul to make it 13-0. Hills could not come to terms with Heath’s onslaught and Jordan Bradbrook scored Heath’s third unconverted try from his own kick through. A runaway win looked on the cards but the South Yorkshire side had other ideas and ground their way into the game. The visitors’ pack were in control but dogged defence held Hills at bay until the 25th minute when winger Ryan Richardson went over in the corner for an unconverted try. Heath lost Bradbrook to injury and Callum Harriett-Brown, introduced on the flank, linked with Merrie to stride forward. However, the Hills revival gained further momentum when their forwards went in for a converted try to make it 18-12. A further converted try on the stroke of half time gave the visitors a one-point lead and marked a turnaround in their fortunes. Heath lost Matt Beasty to a cut head, sustained in a melee, but pressed hard from the second half restart. Hills held out and after a Hinchliffe penalty miss on 45 minutes it became a mid-field slog with players beginning to suffer minor injuries. Both sides had spells on the attack and Hills turned down a kickable penalty and a chance to regain the lead in favour of a scrum but Heath won the ball and Crabtree put in a superb clearance. Frustrated Hills had a player sin-binned and Merrie took advantage for a relieved Heath, who remain one point behind Scarborough in third ahead of next week’s trip to York.